* the reason or reasons one has for acting or behaving in a particular way. * the general desire or willingness of someone to do something. "keep up the staff's motivation"
My posting has been spotty, and my desk is a mess. I have a goal today to have all the cards on my desk sorted and put away. I plan to have all the Tis The Season cards packed up and to start shipping new week, along with a few packages I owe people. Seems like a tiny process when I type it, but it's a big hunk of meat to bite off. Right around the holidays, Wes at Willinghammer Rising did a claim-away. He posts cards. You claim what you want. Wes mails them. 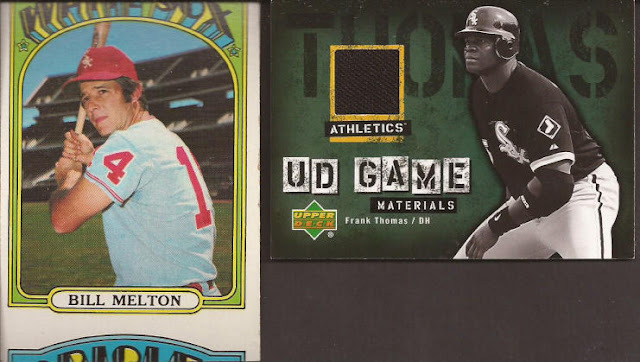 Jumped on just two, but I fine two for my collection, with a super awesome miscut of Beltin' Bill Melton and a swatch of the Big Hurt. 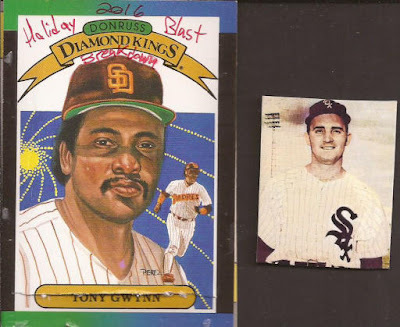 Gavin at the amaze-balls Baseball Card Breakdown sent out some Christmas mailings. Gavin - I love the card you used for your greeting. 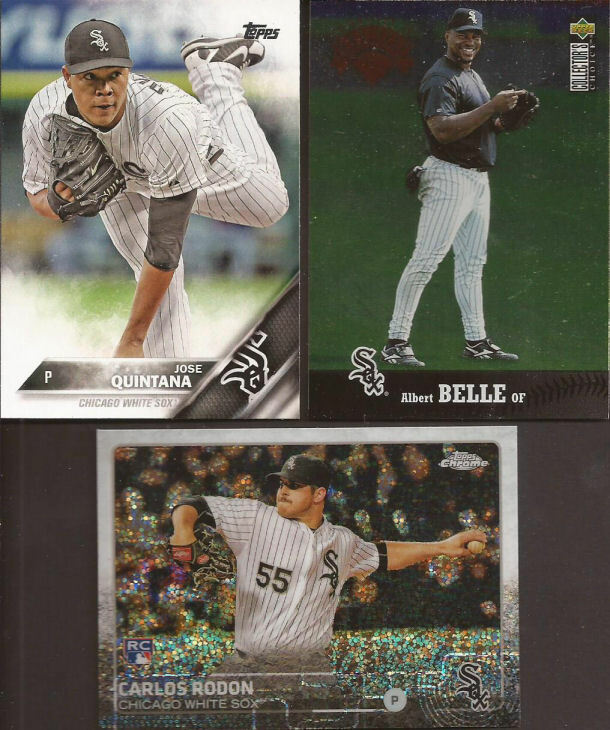 Well tailored packages for all, and that meant I got White Sox and collection cards, like these three sweet miscuts. 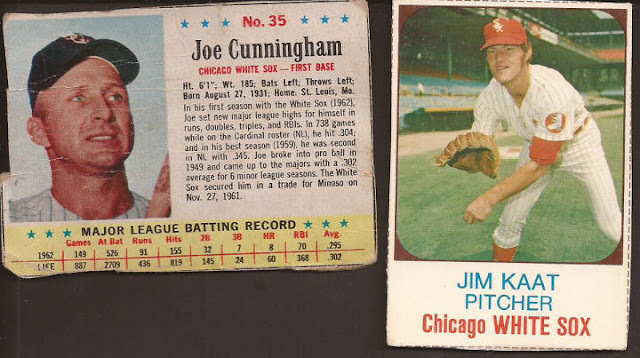 BTW - that Big Train card in from the '73 Topps set. That's how you incorporate the old timers, Topps. A green Paulie for the binder. And as others have shown, Gavin made custom rip cards from junk wax Gwynns. I pulled # 8/25. Let's rip!!! And by "rip", I mean carefully slice the bottom with a knife. I couldn't bring myself to destroy the fine work Gavin did. Plus I think it will fetch more in this state on the secondary market. Inside it that sweet custom magnet of Billy Pierce. If only I had the time (and motivation) to do customs. Nice mailer from AJ at The Lost Collector, which is one of the envelopes that is actually ready to leave my desk. 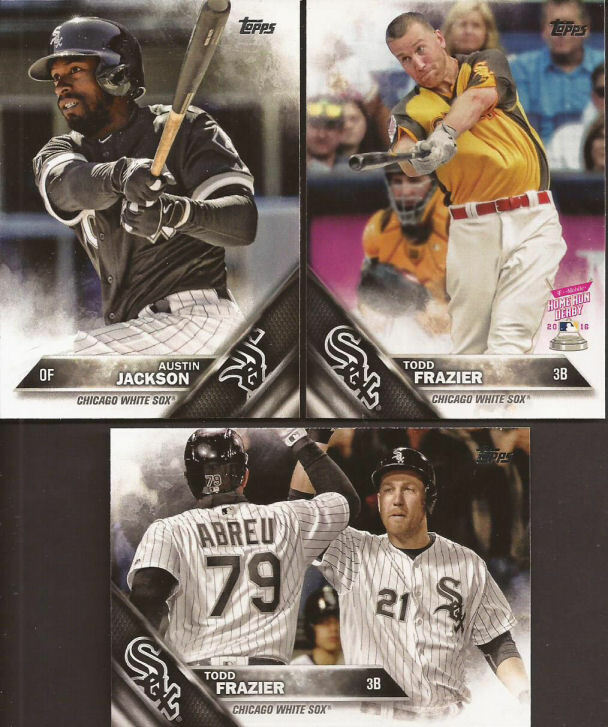 What is still on my desk from AJ is a good stack of ChiSox cards. Love when the Chrome high series cards. The background is kind of cool and interesting. I really should become a Karkovice super collector. And with the dupes I have of him, I could knock out a custom collection. Let me say this: if Topps ever puts his autograph into the Fan Favorites, I'll build a binder of him. Last up is my local pal Nick from Dime Boxes. We should be paling up at Orland for a show soon. Or at the Rosemont show in March at the very latest. But he recent finds are always my benefit, like a few from the Update series of this last year's flagship. And yes - that T Mobile logo looks f*cking stupid. But get used to it boys. The future of cards will be ads. Do I have custom collections? Yes. Has Nick contributed many cards to those collections? Yes. Here's a few new ones. I love that Boston and the Yankees still have no name on the back of their home uniforms. I think those are the only two teams, right? Also, when I think of Rod Carew, it's usually in that blue Twinkies uniform dragging a bunt. I don't think I can imagine him on any other team performing any other baseball action. Ya know why I love Nick's mailers? Two reasons. One, there is always something old within the stack of cards. And two, I don't have to feel guilty for the vintage cuz I know it didn't cost more than a dime for the card. I am not sure why the vendors on the north side never come down south. 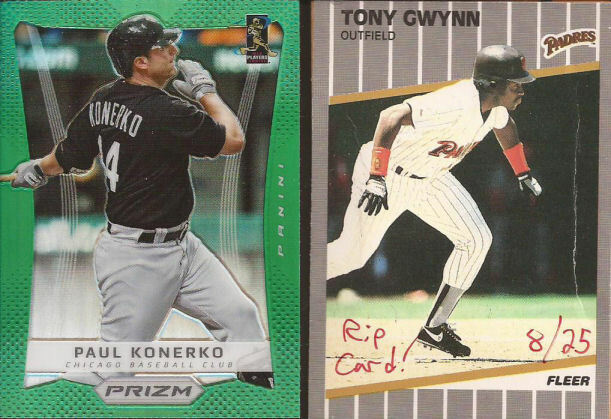 Then again, maybe a south sider should travel up north into enemy territory to rescue my team's cards. So there we have it. A big thanks to all four of you guys. Love your blogs. Love your generosity. You know there will be returns shortly, when I actually find the bottom of my desk. 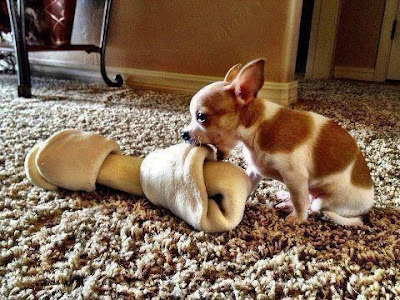 Tony Robbins should be stopping by shortly to help. Good to see you posting again, I know how hard it can be to find the motivation (or time) to post, and the more backed up you are with cards/ideas, the harder it is to get started. 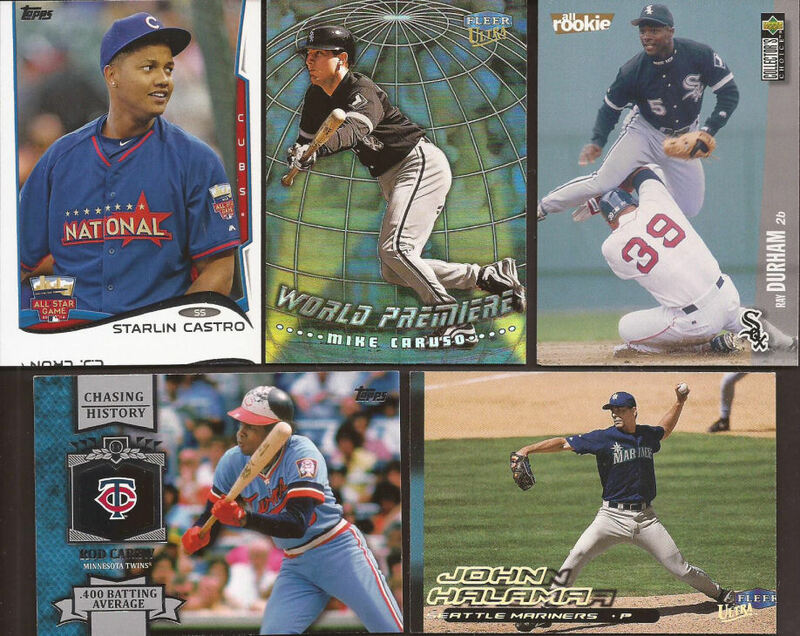 Lots of neat cards here, That Starlin Castro miscut is particularly interesting because I didn't think Topps miscut cards anymore. And I think the SF Giants are the only other team without names on the back of their jerseys, but I'm not sure if that's home or road, and it was a while ago so that may have changed. I agree. How are they still miscutting cards in 2013? I thought only my high school students said, "amazeballs." That was a surprise reading that! Great to see another magnet freed from one of Gavin's rip cards. But the real treat was that rendition of Eye of the Tiger. Very cool stuff. Glad you enjoyed everything! I'm still working out the details, but I'm hoping to make it up to Orland sometime next month. Do the Sox ever throw back to those red unis? I like them a lot. Great cards you received.